A farmhouse situated in the natural beauty of the landscape near the Verdon Canyon in Parc Naturel Regional du Verdon in Provence, France. A farmhouse sits on a lush green plateau surrounded by the massive rock formations blanketed with greenery near the Verdon Canyon in Provence, France. If tranquility and wilderness is what you are after, this location is more than anyone could ask for. As you hike through the Verdon Canyon in Provence, France you will find a landscape of natural beauty where you can stand upon cliffs overlooking lakes and the deep gorges of the canyon. This farmhouse is set away from any other properties and there is a world of nature right at its doorstep. Walk out into your front yard where you can admire the steep cliffs that tower above you as the quiet life and fresh air keeps one alive and healthy. There are many small communities throughout Parc Naturel Regional Du Verdon in Provence, France with each one being made up of extremely friendly people. 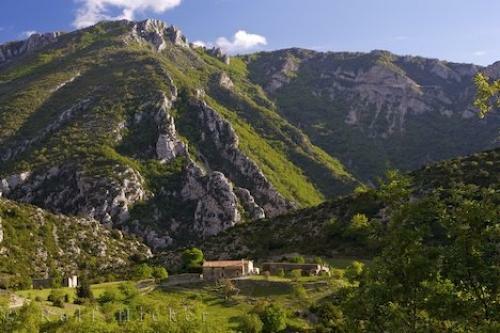 Photo of a farmhouse surrounded by the spectacular rock cliffs near the Verdon Canyon in Provence, France in Europe. Pictures from photo gallery "Provence Pictures"
This picture is part of the photo album "Provence Pictures" - there are more beautiful images waiting for you. ... During summer, this farmhouse is surrounded by the flora and fauna that makes the Verdon Canyon even more spectacular than it already is. Travel in the winter can be fairly treacherous throughout the canyon in Provence, France and people passing are far and few between leaving the area very deserted and peaceful. If visiting Provence, France, be sure to venture to the Verdon Canyon as the scenery is outstanding but be extremely aware of the weather, as this can change within a blink of an eye. Farm house near the Grand Canyon du Verdon, Gorges du Verdon, Parc Naturel Regional du Verdon, Alpes de Haute, Provence, France, Europe. I photographed this photo with the digital SLR camera model Canon EOS-1Ds Mark II, aperture of f/6.3, exposure time of 1/80 sec. on ISO 100, as always I used a original Canon Lens, the focus lenght for this picture was 40mm.